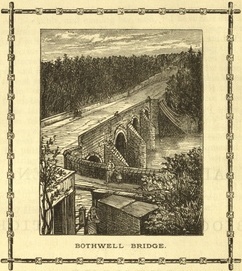 The story of the Covenanters defeated at Bothwell Bridge and sent aboard the Crown of London as slaves is a sobering story. There are pictures on the web of the monument on the coast of Orkney near the sea as well as the Covenanter Fountain in Kirkland. Following the disastrous Battle at Bothwell Bridge on June 22, 1679, in which Covenanters were defeated in the battle, close to 1200 Covenanter prisoners were taken to Edinburgh and imprisoned in a make shift, open air prison next to Greyfriars Kirk (church). Some were tortured and killed immediately. Others died of natural conditions due to the harsh conditions of the site. Others were pardoned and set free under the August 14th Act of Indemnity that same year. But our attention today focuses in on the approximately 257 alleged ringleaders, including Covenanter ministers, who were sentenced to be shipped to the West Indies or Virginia as white slaves. Setting sail from Leith, Scotland, on the prison ship, Crown of London, on November 27, 1679, they sailed only a short while before bad weather forced them into a port. Despite warnings from the locals to not attempt to sail, they had hardly cleared the land mass when the ship lost its anchor on December 10, 1679, striking rocks off of Dearness.The captain, Thomas Teddico, described as a profane, cruel wretch, ordered the crew to escape by chopping down the mast and riding it to the shore. The prisoners in the hold, who had their hatches chained to prevent them from escaping, were left to their own straits. All of them perished, with the exception of around 50 who were enabled to escape by means of a ax which one prisoner had with him. During the next several days, bodies of the dead prisoners washed up at the beaches, and subsequently were buried in the area.